If the American economy was the strongest in the history of all mankind as we were taught, why did it collapse without warning in 2008 over a weekend on the news of a single corporate bankruptcy? Why were America’s politicians caught staring at the camera without a sound bite at hand? How can world’s strongest economy burst like a house of cards? 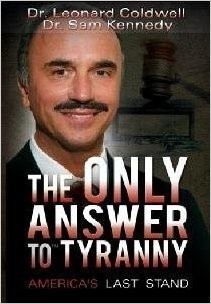 These answers – a scandal beyond imagination whereby the gold reserves and wealth of the American people were hijacked by a secret American aristocracy – are revealed in the Dr. Coldwell Project based on The Only Answer To Tyranny book: America’s Last Stand, the remarkable true story of the orchestrated dismantling of the American republic, and the efforts of 1300 ordinary Americans to restore the American dream. Using secret government documents, America’s Last Stand brings you the story of this global banko-terrorist campaign: the super secret $35 billion account reserved in your name at DTC, the $700 billion dollar blowout of your money, and more will be revealed in this 8 hour audio set.